Hello everyone! 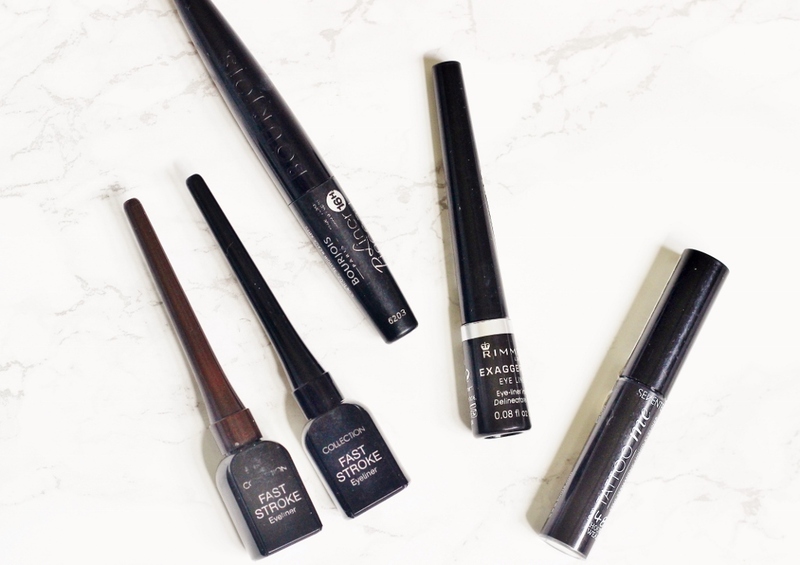 I frequently say that eyeliner is a staple in my makeup routine and if I could only wear two makeup products for the rest of my life, it would be concealer and liner for sure. So, because of this unending love for the stuff I have quite a large collection of them and as I keep getting questions for recommendations I thought I’d combine them all into one post. It’s not a good idea to have such a huge collection by the way, since eyeliner’s 'recommended' shelf life tend to be around 6 months, but normally when there are special offers...3for2s etc. I end up buying a new liner or two..this has got to stop! The reason why I love lining my eyes is because it makes the biggest difference! Eyes look larger, you can do a little flick to make them look longer or you can go all out and do a classic wing - timeless. Somehow my makeup never quite feels complete without those two lines on my eyelids and so it’s not really so surprising that I have tried so many. Also just a quick note, I am a big fan of drugstore and high-end makeup however there are some products which are only worth picking up from the drugstore - eyeliner being one of them. 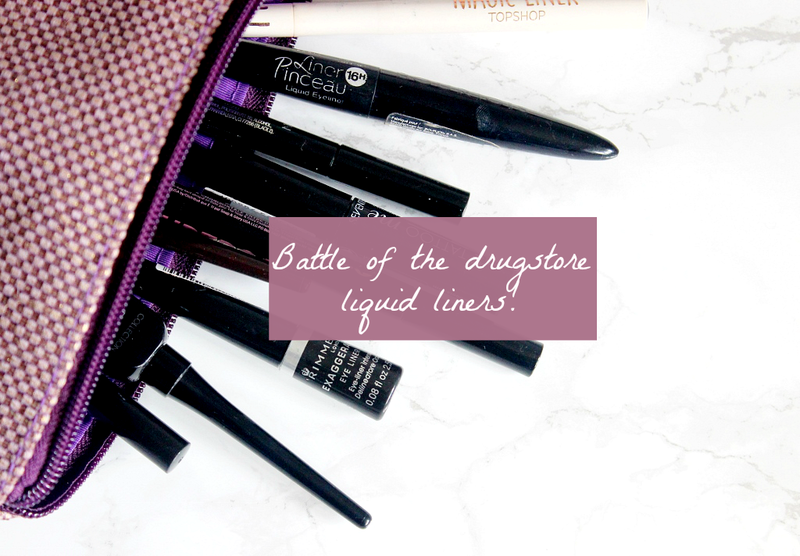 The reason being is the range you can find in your local boots or superdrugs is fantastic and so is the quality - so don’t overlook the drugstore if you’re used to picking up liners around the £20/£30 pricemark, you could save a pretty penny! There are four types of eyeliners available, pencil, pen, liquid (pot) and gel. This post will only cover pen liners and liquid pot liners because they’re the ones I typically use on a daily basis to line my top lids. Pencils are better for tight-lining and the water line. Gel liners are brilliant, but that is for another post. So let us begin! These are the eyeliners which look like a pen and so are comfortable to hold. Many people recommend this type of liner for beginners because you typically have the most control over a pot liner. Less product is dispersed and its less messy too. The main problem you can run into with pen liners is that they have the tendency to dry out quickly - always store them downwards! This way the ink will be built up near the nib and you won’t have the frustration of drawing half a line and then running out. Price wise pen liners are pretty budget friendly and if you are a newbie to lining your eyes I may have the perfect one for you! This is a newer liner in my collection so not one I have used frequently but I have to say I’m vey impressed. The nib is pretty slim with a sharp point meaning it’s easy to create a flick and actually lining the eyes is a piece of cake. Some nibs can be pretty thick meaning its easy to make a mistake or over-do the line but not this one. The pigmentation is awesome, one swipe is black enough for me and that is always a good thing! It dries quickly, doesn’t smudge and lasts a decent amount of time on the lid - not sure about 24 hours, but it stands its ground! No crumbling, flaking or fading. Removal wise it comes off easily too, again another thumbs up and really what else do you want for 3 quid?? The liner is very affordable so I would recommend this one to total newbies. The only thing I’m unsure of so far, is how long the pen lasts once opened, but to be honest even if its around 2 or 3 months I still think it’s worth repurchasing a couple of times a year - especially in a 3for2! I picked this up over a year ago from beautyjoint.com (my go to for American makeup)...but I only got around to opening it a few weeks ago. Turns out I shouldn’t have bothered ordering this...it left me very disappointed. Although the nib looks promising (very similar to the collection one) the pigmentation is rubbish! And it was rubbish from the first swipe, so unless I got a bad one I don’t understand why they bother making such useless liners. It takes a good few swipes to get a half decent line and by that time my eyelid started feeling rather abused and scratched. Bottom line: AVOID AT ALL COSTS. I discovered this a couple of months ago after having it in my collection for AGES. 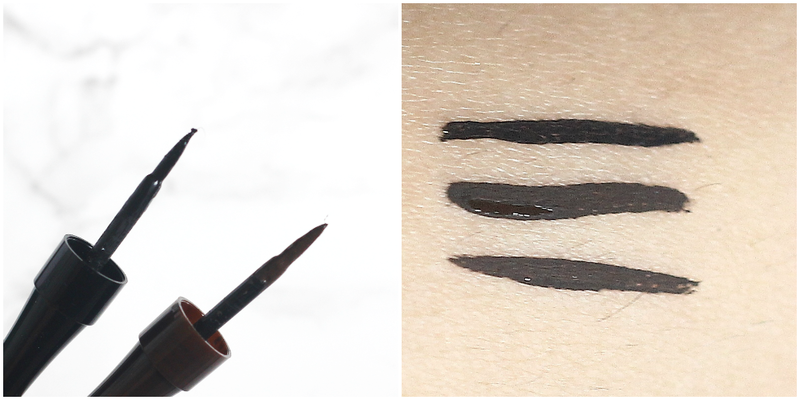 The liner lasts an impressive amount of time without drying up, that’s for sure! Anyways the nib is pretty easy to line and it lasts a decent amount of time on the eyes. I wouldn’t say a full 9 hours but it stretches to 7 at least (this could be different depending on the primer you use, if you do use one). It doesn’t smudge which is another plus and it’s easy to remove at the end of the day. Based on all these points it was one of my favourites, but I’ve realised that there are more pigmented pen liners for a similar (or cheaper!) price point and they’ve lasted longer on the lids for me personally. Rating: 7 Repurchase: Probably not! This is the one that’s knocked the crown off Soap and Glory’s head! It has the best nib from all of them in my opinion, its longer than the others, thin and soft enough to feel comfortable but not so soft that its hard to form a line. I think the nib is made of a foam like material. The size makes it easy to line the eyes and also to create a thin flick, or a thick one too. 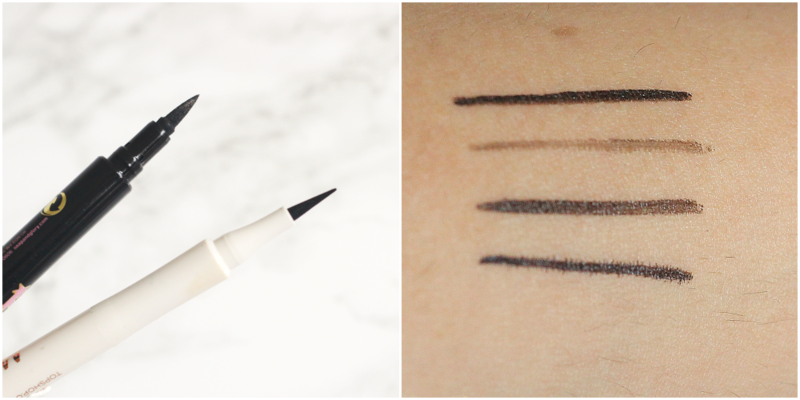 It’s the quickest pen eyeliner to use when I want to create a flick and it’s also very black. It remains intact for a good 9 hours at least. Please excuse the swatch above, I cleared swatches off my arm with a makeup wipe and didn’t wait for it to dry...which resulted in the liner bleeding D: It does not normally do that! Though it does have a wetter formula than most pen liners. The liner is easy to remove at the end of the day and doesn’t flake off. The only downside is that apparently it dries up pretty quickly, as pen liners are notorious at doing. So I’ll probably stock up on these during Topshop’s 20% off sales. Roundup: So there we have the four pen eyeliners and for me the collection one has come out on top! It’s the best for beginners. 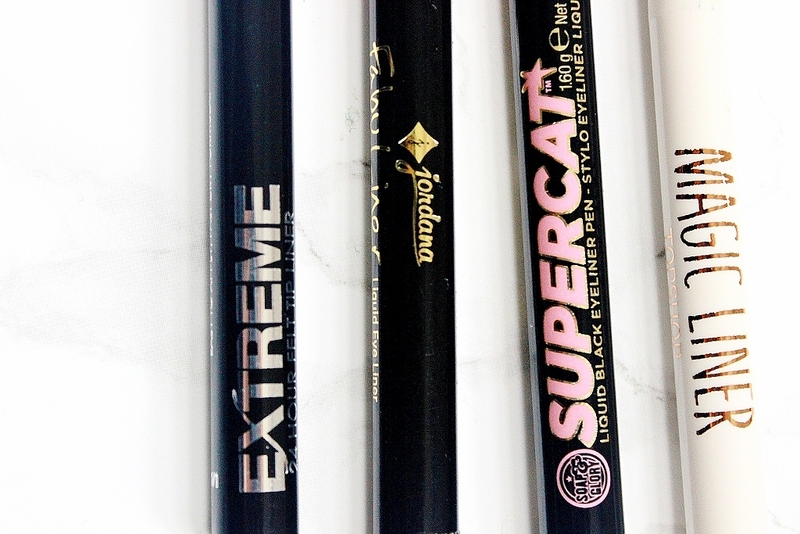 I would also recommend the Topshop magic liner for those of you who are a bit more experienced with eyeliners and love to do a cat flick because it’s the one that helps you achieve that look the easiest! These are my go-to liners over the pens because they’ll last you months and months before they dry out. I also started out with lining my eyes when I was 15 using this type of eyeliner...quite impressed with myself because it is no mean feat! Liquid pot liners come with a pot of liquid that you dip the brush in. Formulas really vary from totally matte to glossy and so do brush sizes. These eyeliners are more messy than pen liners because you may have too much product on the brush and overload your eyelid. However once you get the technique right and get used to a particular liner it can be just as quick to line and wing your eyes with these, as it is with pen liners. This liner has already been featured on my blog as one of my favourites of all time because its affordable, super pigmented and easy to use. The nib when you first get it does help you achieve a neat line in one stroke and the point is fine enough to get a wing. This liner also lasts for ages! The value for money is awesome. I love the brown liner for a slightly softer look, but the black is my most used. So you can understand why I had to write a review. However I have two issues with this, firstly after a few months the shape of the nib becomes distorted meaning its very hard to achieve a thin line, as you can see from the swatches above. Secondly quite a lot of people have said that it can sting their eyes so if you have sensitive ones perhaps keep away. 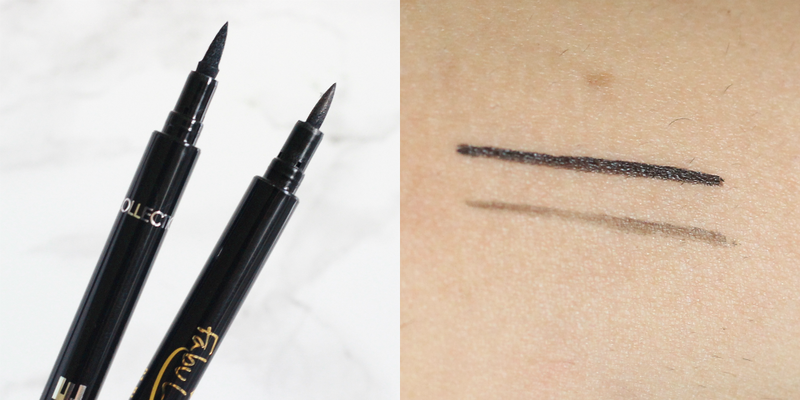 I tend to go for this liner when I want a strong wing and for the price it’s pretty good! P.S I am definitely chucking these two away though, those lines are ridiculous. This was the ORIGINAL eyeliner in my life, the first one I used back when I was just getting into makeup and funnily enough the other day I found some clips from a geography project, in which I was the news reporter and the first thing that came to mind was - girl your wing was on fleeeeek. (And I don't use the word fleek on a regular basis fyi) For real guys, my liner was more on point at that age than it is most days now! ._. That’s what I get for continuously opening new liners and trying to use up each one without wastage. 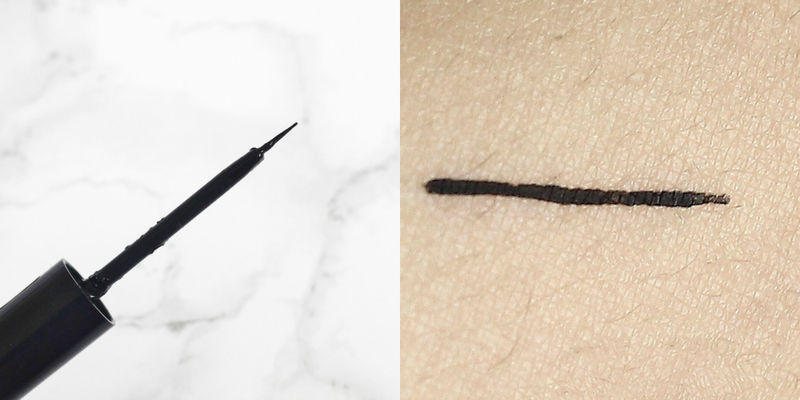 Anyway I really don’t know why I didn’t repurchase this liner sooner, its opaque with one swipe, the brush is wonderful and sturdy, not too thick, nor too thin and the formula is also super. It doesn’t flake or smudge and it stays put! There is no stinging and the brush keeps its shape pretty well. I think I get at least 8 hours of wear from this before it starts fading. It’s also easy to remove at the end of day, so no tugging required. Ding ding ding ding, we have a winner! Rating: 9 Repurchase: Yes I would. 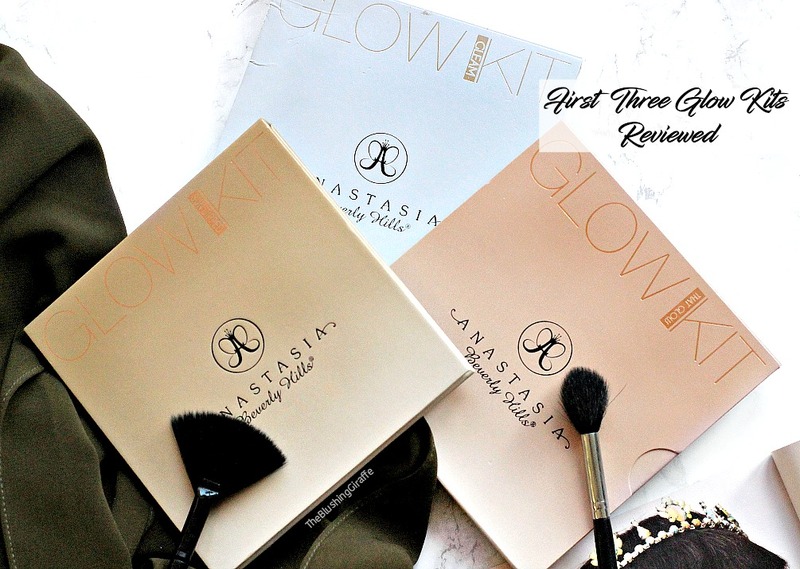 I cannot believe how long it’s been since I reviewed this...and it’s still going strong! Give me a moment to get over my shock here because I reviewed it in January 2014..what?! Anyways this has a super fine brush tip and from all the liners its probably the most similar to an actual makeup brush. Very thin and very flexible. I think it’s a good choice if you always get your liner too thick, or if you have a small lid space because you can finely line the eyelids without much trouble. It’s not as pigmented as the Rimmel one but you can build it up. The main issue I had and still do sometimes is that it just doesn’t last well - UNLESS you have a good base in place! And sometimes that just means dusting some translucent powder over the lids before applying the liner. Overall I’m really impressed with how long this has lasted..and if you can get on with it, it’s awesome value for money! Rating: 7.5 Repurchase: Probably not. 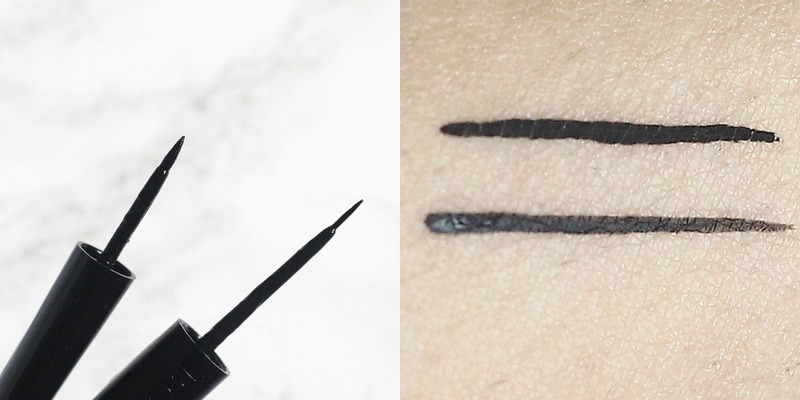 Finally a tricky little liner, but the one to go for if you always find your eyeliner leaves your lid half way through the day. The word tattoo is an accurate representation of how long this’ll last, not permanent of course!! But it is without a doubt the longest lasting liner in my collection. The nib is super thin and I think this is the bit which makes it somewhat tricky to use, especially as the formula is a little sticky? However the pigmentation is awesome, you don’t need to keep going over the line, one swipe is enough. The best way to use it in my experience is to start with the inner corner and take your time. Once you get the hang of it, it’s all good but I have warned you it’s not the easiest. Also to remove it I always go in with an oil based cleanser. Rating: 8 Repurchase: Yes, especially if I was going on holiday to a really hot place. Roundup: So all in all the pot liquid liners came out stronger than the pens, pigmentation wise and I generally have enjoyed using each of these. The one I would recommend to beginners, if you’re feeling confident to use a pot liquid liner is the Rimmel one as the brush is pretty firm and easy to draw a line with. Of course if you’d prefer a smaller brush, go for the bourjois one but make sure your lids are well prepped and if you’re looking for a budge-proof one the Seventeen one is calling your name! 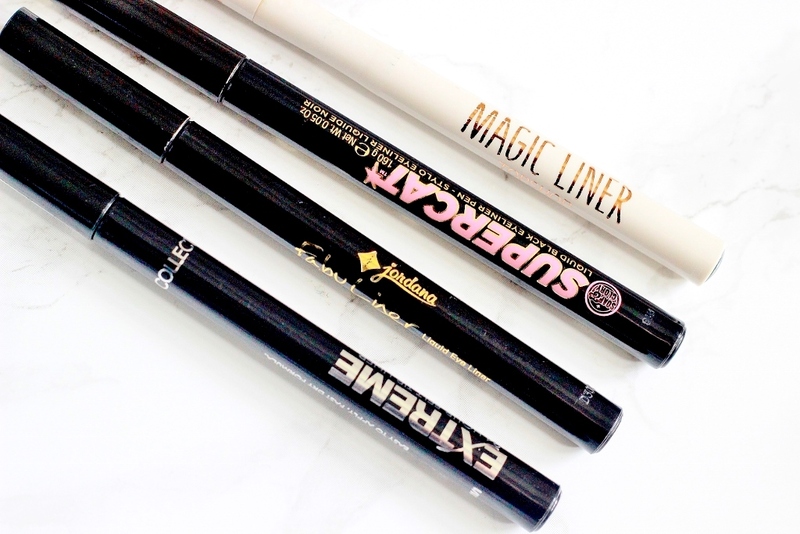 What is your go to liquid liner?